Season West brings lots of fun and smiles to Small World Children Center as the nearly hired Director of the non-for profit child care facility. Season, 34, is originally from Oquawka, but she recently moved to Stronghurst and her 10 year old daughter now attends West Central Elementary. Season knew she wanted to be a teacher at a young age. Following in her grandmother's footsteps, she considers it an honor to do so. After graduating from Union High School in 2001, Season attended Ashford University. She graduated in 2003 with an Associate's Degree in Early Childhood Education. 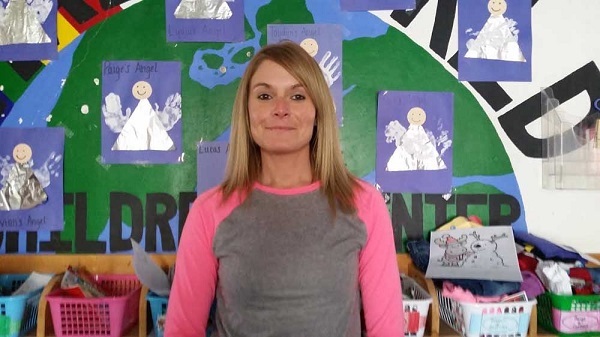 She taught preschool for several years in Iowa and Illinois working at West Central as a Title 1 Teacher's Aid, a Teacher's Aid for West Central Preschool and a one-on-one Aid at the High School. She absolutely loves working with children, but doesn't consider it "work". She never wakes up thinking, Ugh, I've got to go to work today. "I absolutely love doing activities with the children," she says, There is no better feeling than watching a child's reaction when he/she finishes an activity they are proud of. Small World Children Center is located in Stronghurst and currently has openings. It serves children ages 6 weeks through 12 years old. Call Season at 309-924-1757 for information or a tour.